The next generation HDTV is here. 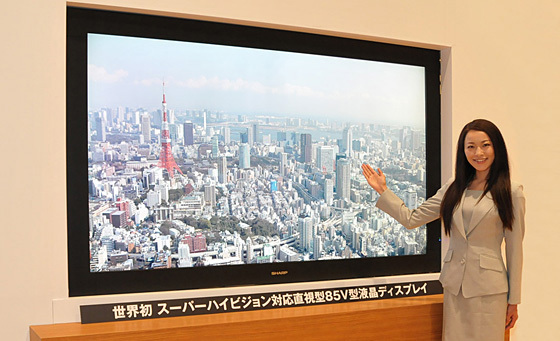 Today Sharp, together with NHK have unveiled the world’s first 85-inch Direct-View LCD display which is compatible with Super Hi-Vision, the next-generation television broadcast format with 16 times the resolution of HDTV today, which is expected to be in our homes in 2020. This 85-inch beast can handle 33 megapixels or 7,680 x 4,320 pixels for “life-like image reproduction”. The ultra high-definition display uses Sharp’s UV2A LCD technology and offers 10-bit color, a brightness of 300 cd/m2 and a 60HZ refresh rate. 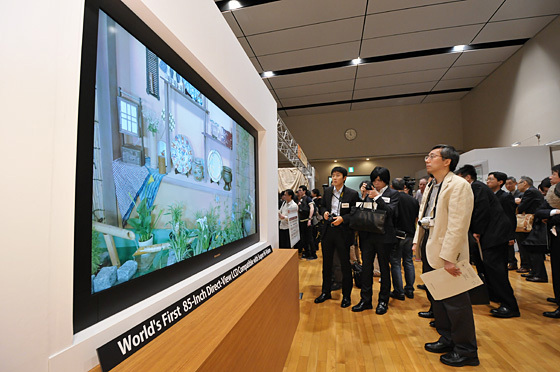 It will be shown to the public at NHK’s Science & Technology Research Laboratories in Tokyo from May 26 to 29, 2011.